Oh dear, my feet! Rumour must have spread about my tatty tootsies as Sockshop got in touch to see if I wanted to road test their Beauty Feet socks. These socks come with a pretty big claim that they will revive heels in 7 - 10 days with their nourishing heel pads. I was intrigued. Who doesn't yearn for beautiful feet? These look like regular black socks from a distance but when you look up close (and pop them on) you can tell there is a neat heel pad which cups your heel. It's barely thicker than the sock and it's comfortable. In there is the secret herbal recipe and Nano-Silver which work with your sebaceous gland, sweet glands and skin to revive your heels. I'm going to point out here that I was sent 2 pairs, so I've not been wearing the same pair every day! They can be washed as regular socks at 30 degrees and air dried, not tumbled and they should last through at least 300 washes, although let's face it, I'm definitely going to lose one well before that. My pair are the ladies size 4-8 but there is a mens 6-11 available as well in black. 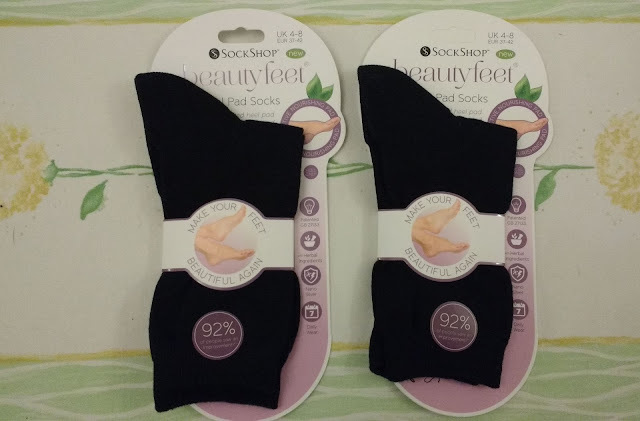 At £8.99 a pair these are no cheap pair of socks; with a lovely thick and soft cotton feel, they are excellent quality as a black sock and the fact that they are nourishing my heels and making them softer gets and absolute thumbs up. I love them. After giving them a good lot of wear I can hand on heart agree that my feet do feel in better shape which is brilliant! Tempted to treat your tootsies too? It's amazing what 'they' come up with these days, if I'd seen these I'd have put them in the 'will never work' category, but then I'm a cynic!